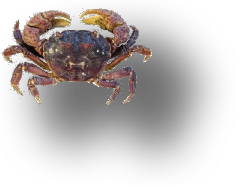 As of 1981, the yellow shore crab and the purple shore crab were relatively abundant in rocky intertidal invertebrate communities in the Coos estuary (Daly 1981). More research is needed to evaluate status and trends for the numerous non-Dungeness crab species in the Coos estuary. Figure 1. Location of other crabs study sites. species found at that station. Also shown is a complete list of species and where they were found. 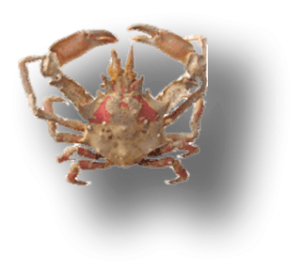 In addition to Dungeness (Cancer magister) and red rock (Cancer productus) crabs, there are at least 30 known crab species historically found in the Coos estuary. Surprisingly little is known about the status of these crab species or how they’re using the estuary. Studies of these “other” crab species are either dated (e.g., Daly 1981) or included incidentally in other studies (e.g., deRivera et al. 2005)(Figure 1). The most comprehensive study of other crabs is nearly 85 years old – a thesis from 1930 completed by John Queen. Queen exhaustively surveyed 12 stations throughout the Coos estuary, finding 30 species of crab regularly using various habitats in the estuary (Figure 2). 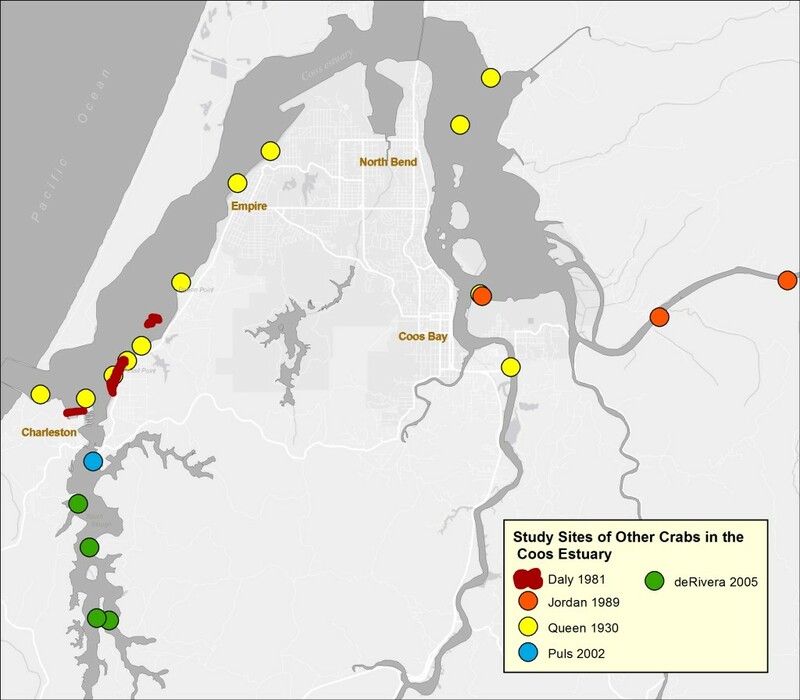 While Queen’s study provides an excellent historic baseline for other crabs in the Coos estuary, the data are obviously of limited use for understanding the status of current crab populations. It’s worth noting that the Coos estuary has changed considerably since that study was completed, including major changes in bathymetry, hydrology and geography (e.g., in 1930 Pony Slough drained to the west, where the airport runway now is; there is now a jetty creating the Charleston inner boat basin; the main shipping channel has been dredged wider and deeper). As a result, crab habitats have also understandably changed dramatically, with some being augmented and some diminished. 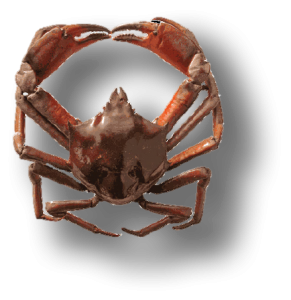 Two introduced crabs (the Atlantic mud crab, Rhithropanopeus harrisi and the green crab, Carcinus maenas) were not documented in the 1930 study, but are relatively common now. Non-native and invasive crabs are discussed in Chapter 18: Non-Indigenous and Invasive Species. Several species (see below) have been studied since 1930, although none in the past few decades. We found no record of the remaining species having been studied since Queen’s effort. The following information summarizes our current understanding of how different species of non-Dungeness crabs are using the Coos estuary. 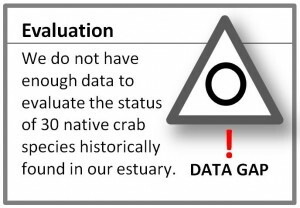 To fill the considerable data gaps about the status and trends of “other” crab populations in the Coos estuary, further research and monitoring of these species should be considered. Yellow Shore Crab: The yellow shore crab (Hemigrapsus oregonensis) is a native crab which, along with the purple shore crab (see following summary), dominates the invertebrate populations in the rocky intertidal areas of the Coos estuary (Daly 1981). Yellow shore crabs have been found in salinities as low as 3 in the Coos estuary, which overlaps with the salinity range of the non-native Atlantic mud crab (Rhithropanopeus harrisi). Anywhere their habitat ranges overlap, yellow shore crabs push juvenile Atlantic mud crabs into more freshwater habitats, effectively limiting the non-native crab’s populations in the Coos estuary (Jordan 1989). A more recent study in 2002 by Puls on the larval migration of the yellow shore crab provides some insights into the life history of this small crab. Puls captured over 43,000 yellow shore crab larvae in four plankton sampling sessions in South Slough and went on to describe how, over a four to five week period, newly spawned larvae are exported from the estuary to the ocean where they develop. 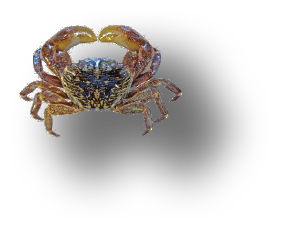 They are then most likely imported back into the estuary as more mature crab “megalopae” before finally settling out in the estuary’s rocky intertidal areas as adult crabs. However, little is known about returning megalopae numbers or abundance of adults in the estuary. Purple shore crab: The purple shore crab (Hemigrapsus nudus), along with the yellow shore crab, represent a dominant portion of the macrofauna found in rocky intertidal areas in the Coos estuary, with densities exceeding 100/m2 (Daly 1981). The purple shore crab frequently out-competes the yellow shore crab for their preferred refuge of large rocks in the estuary’s intertidal zone (Daly 1981). Rocks provide protection from predators and from desiccation and high temperatures during low tides. Large rocks are more stable from wave action and thus a highly valued resource for crabs. Striped shore crab: Also known as green shore crab, the striped shore crab (Pachygrapsus crassipes) dominates the rocky high intertidal zone in the Coos estuary and can often be found crawling among jetty rocks (Daly 1981, Rudy et al. 2015). The northernmost range for this crab is near Newport, OR, probably determined by low winter temperatures (Hiatt 1948 as cited in Rudy et al. 2015). 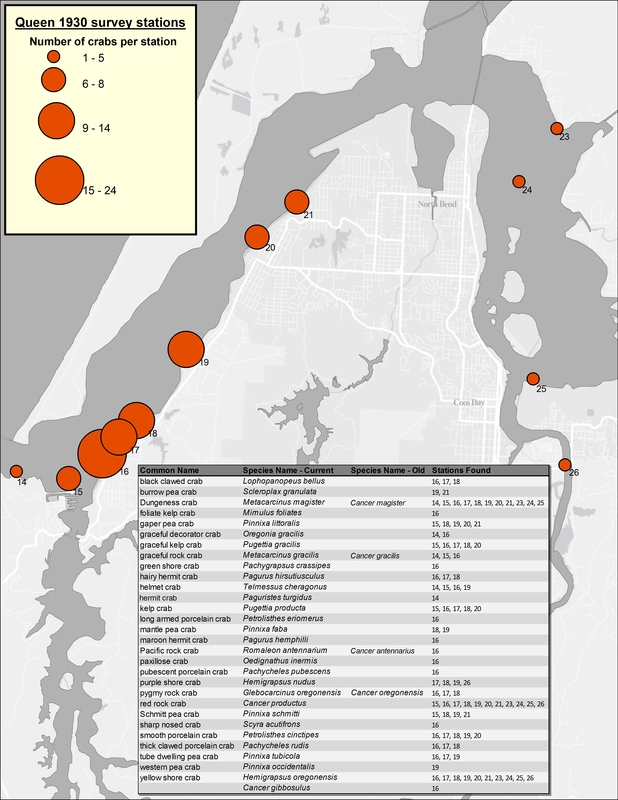 Puls (2002) investigated larval abundance of the striped shore crab and found low numbers present in South Slough (over 1,500 larvae counted over 3 sampling periods). This study speculated that the lack of suitable habitat for adult shore crabs in South Slough could account for the low crab larvae numbers there. 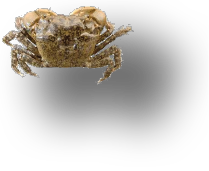 Other crabs: Numerous other crabs can be found in the lower estuary in higher salinity waters including the pygmy rock crab (Cancer oregonensis), found at Fossil Point and Pigeon Point in the rocky lower intertidal and rarely found south of Oregon (Rickets et al. 1985); the kelp crab (Pugettia producta), found in the South Slough hanging onto kelp, eelgrass or pilings; the porcelain crab (Petrolisthes cinctipes), found at Pigeon Point under rocks or in mussel beds; and the hairy hermit crab (Pagurus hirsutiusculus), found in the South Slough at Collver Point or Metcalf Preserve, often under algae or eelgrass (Rudy et al. 2015). The pea crab (Pinnixa faba) is a parasitic crab that primarily lives inside live gaper clams (Tresus capax), but can also be found in soft-shelled or bent-nosed clams (Rudy et al. 2015). Limited sampling by deRivera et al. (2005) did not find pygmy rock crab at any of four sampling sites in South Slough. Without additional research, the status of this species in the South Slough and other parts of the Coos estuary remains uncertain. Hiatt, R. W. 1948. The biology of the lined shore crab, Pachygrapsus crassipes Randall. Pacific Science 2: 135-213. Puls, A. L. 2002. Transport of zooplankton in South Slough, Oregon. [MS Thesis]. University of Oregon. Ricketts, E. F., J. Calvin, J. W. Hedgpeth, and D. W. Phillips. 1985. Between Pacific tides. Stanford: Stanford University Press.